The Maine Medical Association has partnered with the American Medical Association (AMA), with guidance and support from the National Association of Chronic Disease Directors (NACDD), to raise awareness of prediabetes resources, help providers connect their patients to CDC-recognized Diabetes Prevention Programs, and allow patients to take charge of their health. AMA and the CDC have created Prevent Diabetes STAT (Screen / Test / Act Today), a toolkit to help health care providers identify, engage and test patients at risk for prediabetes and refer patients with prediabetes to CDC Recognized Diabetes Prevention Programs. CDC-recognized diabetes prevention lifestyle change programs connect patients who are at risk for Type 2 diabetes with trained lifestyle coaches and group support to make long-term commitments to eating healthier, reducing stress and getting more physical activity to achieve lasting results. 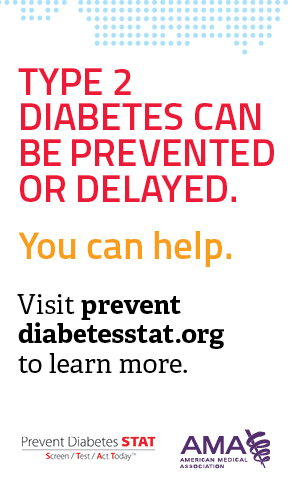 More information on AMA’s Prevent Diabetes STAT, including a download of the complete toolkit, may be found here.